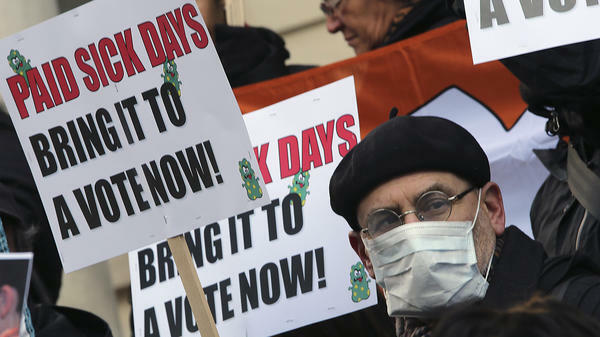 Activists hold signs during a rally on Jan. 18, 2013, at New York's City Hall to call for immediate action on paid sick days legislation in light of the continued spread of the flu. Last month, New York City began requiring employers to provide paid sick days, joining the ranks of other cities such as Washington, Seattle and San Francisco. Most restaurant workers don't get paid when they stay home sick, so many report to work anyway. "The fact that we're forcing people to go to work sick is not something we want to do as a society," says Maryland state Rep. John Olszewski Jr., a Democrat. "We shouldn't put people in a situation where they're forced to make impossible choices between themselves and their work and their families." Last month, New York City began requiring employers to provide paid sick days, joining the ranks of other cities such as Washington, Seattle and San Francisco. But while several cities have been willing to impose such requirements, states have been more reluctant. Olzewski's bill attracted a majority of his fellow state House members as co-sponsors, but went nowhere this year. Instead, a number of states — particularly in the South — have passed laws that block local governments from imposing sick day requirements on businesses. "The problem I see with paid sick leave is not so much offering it, but the fact that it's mandated," says state Rep. Gail Lavielle, a Connecticut Republican. "It seems as though the state is determined to do everything it can to discourage businesses from coming here and staying here." The more money you make, the more likely it is that you can stay home when you're sick and still get paid. A big majority — 87 percent — enjoy that benefit among the top 25 percent of earners. Only 34 percent of those in the bottom 25 percent have the same privilege, according to the Bureau of Labor Statistics. Part-time workers are usually out of luck. 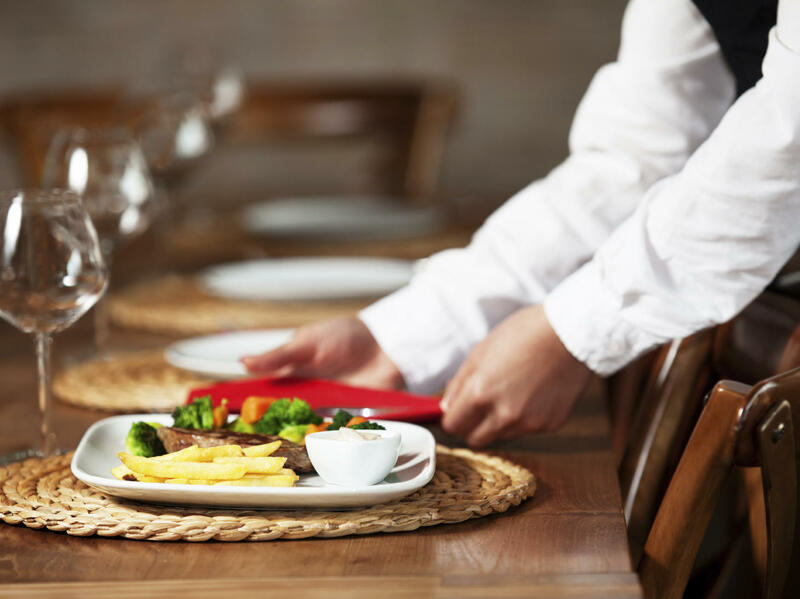 "Servers in restaurants and home health workers are the least likely to have paid sick time and the most likely to have contact with the public," says Vicki Shabo, vice president of the National Partnership for Women & Families. A number of women's organizations have embraced the cause of providing paid sick leave. House Democrats tout the idea as part of their "economic agenda for women and families." "It is not only good for workers, but also for businesses who have lower retention costs and greater productivity, as well as the broader economy," says Rep. Rosa DeLauro (D-Conn.), who has sponsored federal legislation mandating paid sick leave. With Congress unlikely to address the issue, the action is in the states. In 2011, Connecticut became the first state to mandate paid sick leave. A survey of Connecticut employers released earlier this year by the Center for Economic and Policy Research and the City University of New York suggests that the cost for businesses has been minimal. "A year and a half after its implementation, more than three-quarters of surveyed employers expressed support for the earned paid sick leave law," the study concludes. "That's probably the opposite of what we're hearing," says Nicole Griffin, executive director of the Connecticut Restaurant Association. "When the paid sick leave bill passed in Connecticut, employers felt it was yet another burden we'd have to deal with." When restaurant workers are sick, she says, they're better off trading shifts with other workers. That way, they can earn tips when they do come in, rather than just collecting their base salary. "Restaurants certainly don't encourage workers to come in sick," Griffin says. "That's why we have flexible shifts and hours." This week, the Connecticut House approved changes to the law to simplify the ways companies tally up workers and their hours. It's only a tweak, says Rep. Lavielle. No "intelligent employer" is going to tell workers to come in when they're sick, she says. That's bad for morale and also bad for productivity and retention. But the law as written doesn't allow employers recourse if workers abuse the privilege, maxing out on "mental health days." After Milwaukee voters approved a sick leave ordinance in 2008, the Wisconsin legislature passed a law prohibiting local governments from imposing such mandates. That move has since been copied by 10 other states. The coalition against paid sick leave often includes the same trade associations that oppose minimum wage increases, making many of the same arguments about burdens on businesses. They say the existing local mandates have reduced profits and forced cuts to other benefits. "The paid sick leave bill, in our opinion, would put thousands of jobs at risk and discourage businesses from coming to the city of Philadelphia," Michael Nutter , the city's mayor, said last year when he vetoed a paid sick day law. Supporters of the idea aren't giving up. Paid sick leave is expected to be on the Massachusetts ballot this fall. "I admit there's going to be a cost," says California state Rep. Lorena Gonzalez, a Democrat who has sponsored a sick leave bill. "However, it's a very limited cost." Gonzalez contends that, under her legislation, expenses for an individual company would increase by no more than 1 percent. She argues that the "societal benefit" outweighs the expense. Otherwise, it's the workers who bear the cost. There are risks when they decide they can't afford to stay home. People with sick leave benefits are more likely to take themselves and their children to see a doctor, Gonzalez says, rather than waiting until things get bad enough to demand emergency treatment. "We have 6 million Californians who can't take a single hour of sick leave," she says. "The public health situation when workers go to work sick creates a dilemma for all of us."